White Wolf : A Four Month Old Red Wolf Pup Practices Yoga. 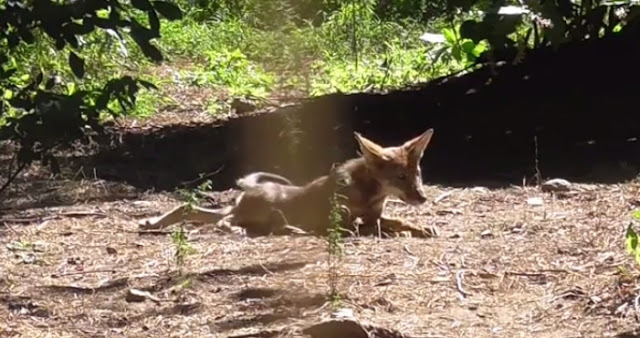 A Four Month Old Red Wolf Pup Practices Yoga. The red wolf is a smaller and a more slender cousin of the gray wolf. It is gray-black, with a reddish cast that gives it the color for which it is named. Almost hunted to the brink of extinction, the U.S. Fish and Wildlife Service rounded up fewer than 20 pure red wolves to be bred in captivity in 1980. As of 2007, approximately 207 captive red wolves reside at 38 captive breeding facilities across the United States. Thanks to these programs, more than 100 red wolves currently live in the wild. Historically, red wolves ranged throughout the southeastern U.S. from Pennsylvania to Florida and as far west as Texas. Today, wild populations roam more than 1.7 million acres throughout northeastern North Carolina, including Alligator River National Wildlife Refuge and Pocosin Lakes National Wildlife Refuge. Red wolves are primarily nocturnal (active at night), and communicate by scent marking, vocalizations (including howling), facial expressions and body postures. Shy and secretive, red wolves hunt alone or in small packs -- complex social structures that include the breeding adult pair (the alpha male and female) and their offspring. Red wolves tend to form pair-bonds for life. Responses to "A Four Month Old Red Wolf Pup Practices Yoga."